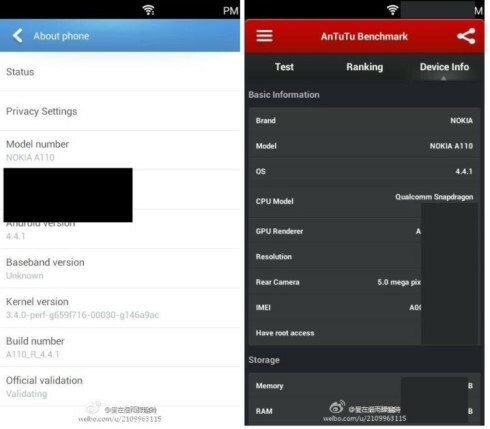 Nokia Normandy Android Phone Leaks; Specs & Images Appear! This may not be a concept handset, but it may remain a prototype forever. 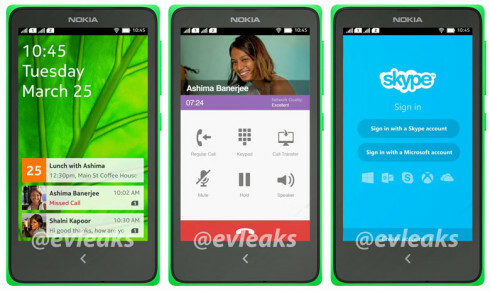 The Nokia Android phone Normandy has been leaked and rendered before, but today it’s the first time we can have a glance at its customized UI. This is Android but with a layer of pure Nokia on top of it. There are times when you feel the influence of MeeGo and Symbian here, particularly on the first screen. Some specs have also leaked for this model, thanks to the benchmark shown below. It appears we’re dealing with a 4 inch dual SIM smartphone with a 5 megapixel camera and the codenamed for it is Nokia A110. The Nokia Normandy relies on a mystery Snapdragon processor and it seems destined for the Indian market, judging by the on screen names. I also supposed it has about 4 or 8 GB of storage and 512 MB of RAM. By the way, the benchmark shows Android 4.4 KitKat is running on this leaked Nokia. Will it ever be real?